Today the Fair Work Commission has released its decision regarding the Transitional Arrangements to the changes in penalty rates. On February 23 2017, the Fair Work Commission released its decision to amend Sunday and Public Holiday penalty rates in a number of Modern Awards. 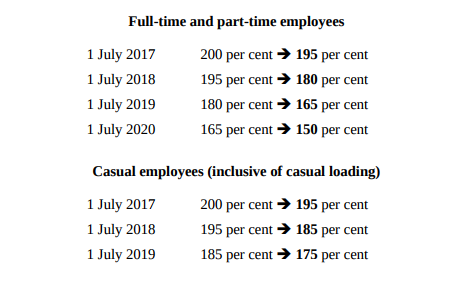 Sunday penalty rates will be reduced to 150% for full-time and part-time employees under the Hospitality Award, the Retail Award, and Pharmacy Award. Sunday penalty rates will be reduced to 175% for casual employees under the Retail and Pharmacy Award. 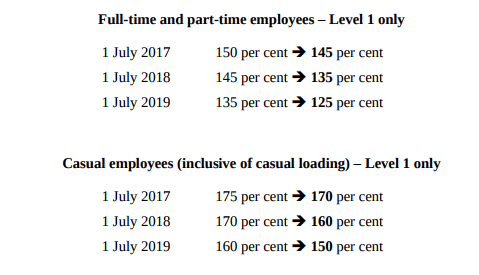 The Sunday penalty rate for casual employees under the Hospitality Award remains unchanged at 175%. Sunday penalty rates for Level 1 Fast Food Award employees will also be changed. Full-time and part-time employees will see a reduction to 125%, and casual employees will see a reduction to 150%. Public Holiday penalty rates were also reduced for the Hospitality, Retail, Pharmacy, Fast Food and Restaurant Awards. The Fair Work Commission faced backlash over the decision, with many employee industry groups citing that a reduction in penalty rates would leave the ‘most vulnerable’ workers worse off as a result of taking home less pay. The Commission has today announced that it was not sufficiently persuaded that the impacts were substantive enough to not go ahead with the proposed changes, citing the positive employment benefits as more significant. 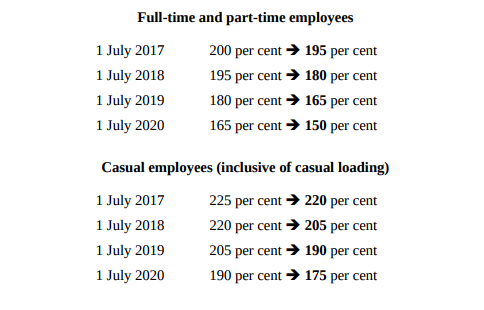 It has also rejected the SDA’s request of introducing different transitional arrangements for current staff and employees employed after July 1 2017, as it would potentially create significant disharmony between employees, and additional complexities for employers transitioning to the new penalty rates. As such, the Fair Work Commission has announced its Transitional Arrangements for the relevant Modern Awards, these are outlined below. The proposed changes to Public Holiday penalty rates will take effect July 1 2017, without transitional arrangements. For more information on the Transitional Arrangements made to the aforementioned Awards, please visit the Fair Work Commission website.